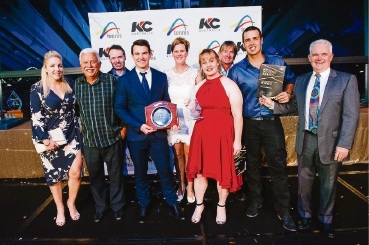 SAFETY Bay Tennis Club claimed victory in two of the most prestigious award categories at the 2018 WA Tennis Industry Awards Night held on Friday evening at Optus Stadium. The club was named joint winner in the Most Outstanding Small Club category alongside Tom Price Tennis Club. Safety Bay secretary Toni Bellingham was also named joint winner of the Volunteer Achievement Award. Safety Bay TC was one of three finalists for the Most Outstanding Small Club category, and was a standout performer in their class, owing largely to the club’s inviting culture, accessibility to the community, and implementation of Tennis Australia programs and competitive opportunities for players. Safety Bay TC has grown and retained a strong membership base, and has been working hard to create a community hub for members and the wider community. A key driver of the club’s success has been the development of their strategic plan to 2020. This plan has motivated members and focused volunteer effort on the tasks to achieve the club’s objectives. Safety Bay Tennis Club is regularly accessible for different user groups and schools, and played host to a Wheelchair Tennis meet and greet late last year. The club has been actively increasing pathways for junior tennis and is a keen participant in Tennis West programs, events and initiatives. Safety Bay Club president Terry Fraser was delighted with the club’s win. “We are elated to have won this award,” he said. “After many years of trying to reignite our club, we now have a club full of energy and enthusiasm. “A few years ago we changed our thinking to focus on people and our tennis community, and we became a place where people wanted to go to. Safety Bay Tennis Club secretary Toni Bellingham has been an instrumental part of the club’s growth and innovation over the last few years. Bellingham has held numerous roles on the committee and takes on a large amount of work that benefits the club, community and tennis as a whole. Bellingham often works more than 25 hours a week for the club in addition to her full-time job. She manages all of the social media and marketing, and is highly focused on increasing community engagement and junior participation. Throughout the year Bellingham has volunteered at the local school running tennis programs with the club coach, and is the main driver behind the increasing number of Tennis League teams. “We do it because we enjoy contributing to our communities,” Bellingham said.